Korean artist Chun Kwang Young has gradually built up a strong international following with his Aggregation series that uses thousands of Styrofoam triangles individually wrapped in printed mulberry paper and pieced together like a jigsaw to create three-dimensional abstract artworks. As well as being wrapped in mulberry paper, each triangle is tied using twisted “threads” of paper to resemble little medicinal bundles that used to be common in Korea. They are also individually colored with vegetal dyes to create a beautiful shading effect on the surfaces. Often, viewers are tricked into thinking that the works have been air brushed after they have been assembled. Over the last 30 years, his Aggregation series evolved from being mainly in monochromatic, black-and-white, or sepia to having geometric pools of vibrant indigo and orange. But some of his most recent works, now on display at Art Plural Gallery in Singapore, have a quieter almost zen-like appearance using gray and pastel colors. His lunar-like abstract landscapes have also given way to a new display of triangles intricately pieced together, so that from far away, they give the appearance of a letter written on printed stationery. “But right now I can feel I’m at an important junction, making changes,” he added. “These new works have more of a painterly aspect, with lovely color that evokes a more peaceful landscape,” he said. The new works, which he started in 2010, have never been seen in public before, and are his personal “letters” to his mother, who passed away more than 10 years ago. “My mother and mulberry paper are the oldest memories I have. I still remember my mother growing up, her peaceful universe. That’s why these colors have a misty, dreamy aspect, I wanted to make a very quiet, peaceful work,” he said. In many ways, the new works are a return of sort to the artist’s beginning in abstract expressionism painting. “I used to do oil paintings a bit similar to this,” he muses. “Assemblage” presents 22 works from 2008 to 2013. Besides these latest pieces, it also includes works with much more movement created by bigger triangles sticking out of the canvas, creating a raw, menacing energy. “What I want is to make the work free,” Chun explained, adding he often becomes completely immersed in his work and can work for hours without realizing any time has passed by. The artist is currently working on an important solo exhibition at the Seoul National University Museum and plans are already being made for an exhibition in London in the second quarter of 2014 at Bernard Jacobson Gallery. 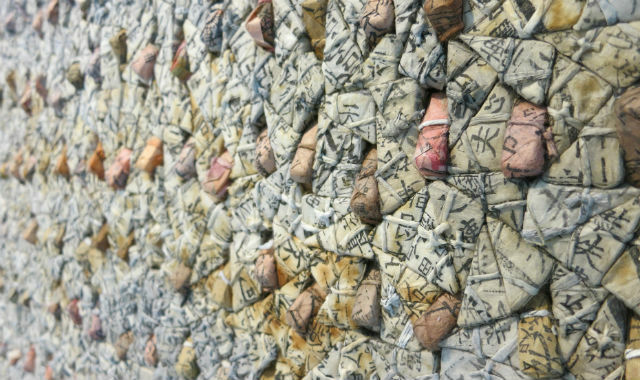 “Chun Kwang Young: Assemblage” runs at Art Plural Gallery until July 27.